The method will provide a framework for identifying, using and combining different budgetary sources to capture the funding dimension of the RIS3 action plan and the needs for funding during the implementation period. Users will be able to access information the potential sources of funding and indicate the allocation of funds by policy measure/action line. One of the S3 aims is to foster more effective spending of public resources, by concentrating on priority areas for knowledge-based investments, focusing on the strengths and comparative advantages of each region. Budgeting is an important tool as it assists RIS3 partnerships to identify what resources are available in shaping and implementing the smart specialisation action plan. The Guide to Research and Innovation Strategies for Smart Specialisations (RIS 3) (2012) refers to “the four Cs of smart specialisation”. The first one is “(Tough) Choices and Critical mass” and refers to the need to limit the “number of priorities based on own strengths and international specialisation – avoid duplication and fragmentation – concentrate funding sources ensuring more effective budgetary management” (European Commission, 2012). However, a European Commission Expert Group (2015) found that “Many of the RIS3 assessed did not provide a detailed budget as requested by the ex-ante conditionality. 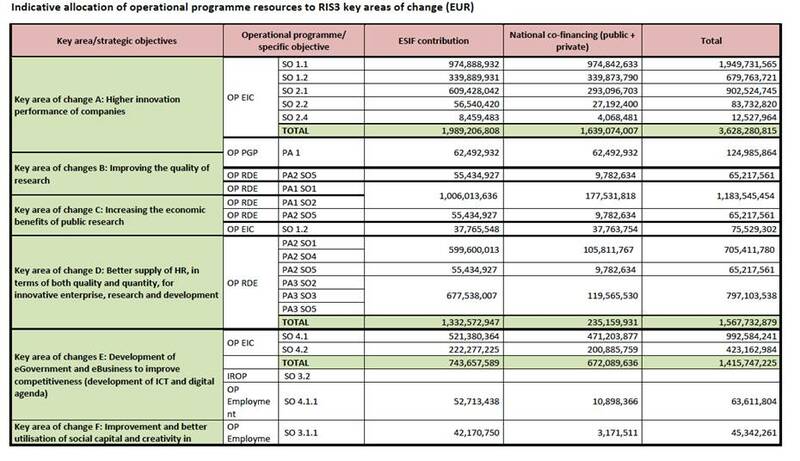 There seem to be an assumption that the RIS3 budget will be equal to the ERDF OP earmarked budget for R&D activities. This does not guarantee, however, that enough funds will be available to implement the RIS3, e.g. if arbitration is needed between different policies”. An example of an initial RIS3 budget for the Czech Republic is provided in annex. A clear link between priorities, policy instruments and budget is important as clear budgeting can help guide the choice of instruments used in the action plan (Nauwelaers, et al., 2015). Knowledge about the available budget and financing sources assists in the choice of appropriate instruments, which in turn is also dependent on the specific regional policy funding context (European Commission, 2012). Budgeting should also take account of various EU funding sources and the potential synergies between different sources (European Commission, 2014). In the process of budgeting, it is necessary to identify all available funding, especially from the private sector that can leverage public sources. It is also important in setting the priorities for the S3 action plan, to include as many stakeholders as possible as the both the government and the industry have imperfect information on their own. Hence, cooperation becomes vital and an “inclusive and interactive bottom-up process in which participants from different environments” (European Commission, n.d.) needs to be created. A transparent and updated budgetary planning framework can also assist in developing an effective procurement schedule for the RIS3 action plan. It can help “To guide procurers to join forces with others, in order to attain critical mass, making it interesting for firms to develop innovative solutions for a bid and in order to pool capacities (legal, procedural, knowledge of market, technologies and performance levels, administrative budgets for the procurement processes, etc. )” (European Commission, 2012). The baseline budget can also be used as an indicator for on-going budget allocation and expenditure, e.g. are expenditures of the programme in line with the planned budget. Furthermore, this information feeds into monitoring and evaluation processes. Flanders in Belgium, for instance, used it as part of the impact scan methodology to monitor the regional innovation budget. Information on both the total amount spent on regional innovation as well as in-depth knowledge of the distribution of this money by policy objectives, intermediaries and services are needed (Nauwelaers, et al., 2015). Does the strategy identify appropriate actions covering the proposed policy mix? Is there sector- or priority- specific support services/schemes foreseen? Does the strategy identify budgetary sources, and does it present indicative budget allocations? Does the strategy create synergies between different policies and funding sources? Ex-post funding received by prioritised areas from generic programmes. At regional level, these types of budgets should include, besides budgets from regional origin, also national funding sources available to the prioritised areas, as well as funding of EU origin. (OECD, 2013) The publication Regional Policy for smart growth in Europe 2020 (European Union, 2011) has a chapter on “financial engineering support” and discusses the different types of funding, e.g. non-repayable grants, loans, venture capital, guarantees and other forms of financial engineering. Potentially identify synergies between monetary, in-kind (e.g. organisations that will provide staff to support implementation) and legal/regulatory instruments. The method will provide a framework for preparing and updating RIS3 budgets based on the sources of funding and committed versus actual expenditure. The method will support RIS3 partnerships and managers in handling the funding dimension of the RIS3 action plan and on-going financial planning during the implementation period. The sources of funding and allocation of funds by type of measure, beneficiary and type of financial instruments will be captured. There are a wide range of budgeting methods and procedures which very much depends on national standard and practices (see OECD, 2014). Hence, the method and related tools will provide a harmonised tool that enables comparison of RIS3 budgets and policy mixes at European level. The tool will not to provide a financial or budgetary planning tool adapted to specific national budgeting rules or accounting procedures. And by funding source (private, national/regional public funds, ESIF, Horizon 2020, etc.). In certain cases, it may also be relevant to capture qualitative information on related non-financial support such as legal/regulatory changes underpinning financial interventions. This could be captured through a comment function allowing users to input notes or additional information. 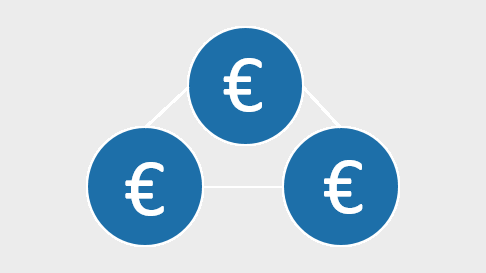 In the case where funding sources are competitive or not yet confirmed, it is useful to provide at least a qualitative positioning analysis with respect to additional funding sources for the main S3 measures, initiatives or key organisations (clusters). 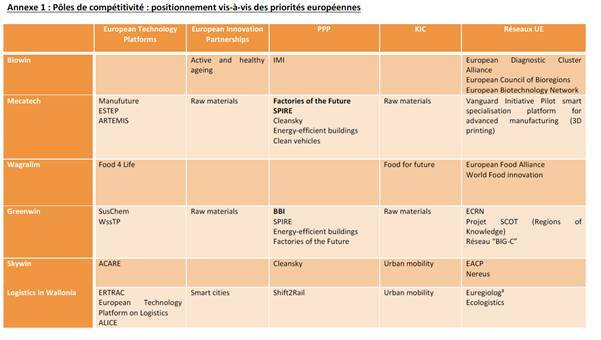 An example from the Walloon (Belgium) S3 strategy is provided below where the Walloon competitiveness clusters are aligned with EU level platforms. The OnlineS3 budgeting tool could include an additional application to enable regions to map key regional/national organisations/clusters with respect to European partnerships or initiatives. The quasi-absence of detailed budget plans in the initial RIS3 strategies has led to a further round of RIS3 action plans during which Member States and regions are requested to provide, amongst other information, more detailed budgeting plans. This tool will support the process of improving budgeting, planning of financial resources, identification of synergies between sources of funds, the extent to which RIS3 are leveraging private finance, etc. The tool will create a complementary and more detailed dataset to the data collected for ESI Fund purposes by managing authorities. It should also provide a means for strategic monitoring of RIS3 as they are implemented as actual versus planned funding/expenditure can be compared over time. The tool will fill a clear gap for users (RIS3 managers and stakeholders) in the current ‘toolkit’ available and should lead to a more harmonised, and therefore, comparable approach to budgeting RIS3. This will be of strategic value at both national and EU levels for future evaluation and reporting purposes. RIS3 managers should be able to access information on the funding spent on relevant S3 and innovation policy initiatives and have a thorough knowledge of the distribution of this money by policy priorities, intermediaries and services (Nauwelaers et al., 2015). When designing monitoring and evaluation activities for smart specialisation, both for the priority-setting and evaluation of programmes, governments may want to develop a pilot exercise on “implementing ‘Smart specialisation-oriented’ public budget pictures of budgets allocated to each prioritised areas by aggregating: i) Budgets allocated to dedicated bodies and programmes (e.g. institutes, centres, R&D programmes, clusters); ii) budgets allocated through preferential treatment in generic programmes; iii) ex post money received by prioritised areas in generic programmes.” (OECD, 2013). However, the tool will essentially be fed by data uploaded directly by RIS3 managers or monitoring and evaluation teams. Hence, there is a need to foresee an online login function so that data entered for a specific region or Member State is protected from unauthorised changes. Agreement on the categorisations to be used when developing the budget tools, e.g. should the ESF secondary intervention codes be included, should there be a possibility to code budgets by industrial (NACE) or scientific/technological classifications, etc. Development of an online tool with a login function allowing identified users to upload data on RIS3 budgets for their region/country. · European Institute of Innovation and Technology (EIT) – Knowledge and Innovation Communities (KIC).